With above reference,the max hard limit that deployment group can contains only 1000 updates ( am sure, no one reaches there due its to package size and replication issue over to the DP’s) but how to I track this information ? check each software update group from Configmgr 2012 console to know its count ? and I cannot do this every time when needed . Here is the SQL query (you can create nice SSRS Report as well ) .to get count of software updates from each SUP Group. with the below SQL query (output) ,I see 2 different things 1) Software updates available in Deployment Group and 2) Downloaded updates from the software updates available in Deployment group. Why there is count mismatch ? Very simple.A single software update can have 2 or more content information which you can see it from the software update properties. 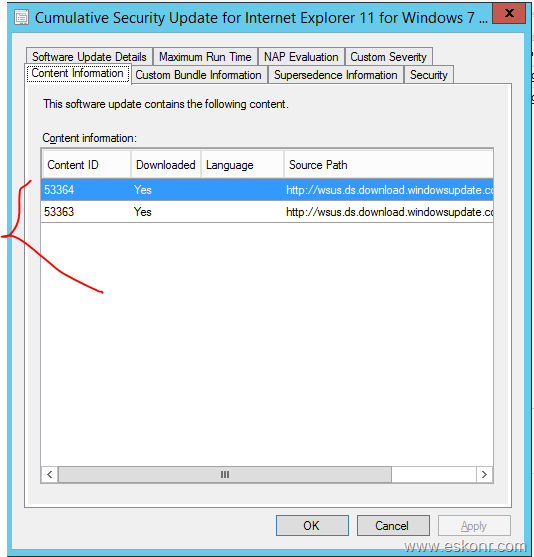 For ex: Cumulative Security Update for Internet Explorer 11 for Windows 7 (KB3021952) will have 2 content information ,both are required to download for deployment to the source path.